During November 2007, a trial excavation was conducted within the limits of H. Kelah (Permit No. A-5297; map ref. 19843–58/64792–812), prior to the development in the industrial zone of Modi‘in. The excavation, on behalf of the Israel Antiquities Authority, was directed by P. Spivak, with the assistance of N. Gubenko (area supervision), E. Bachar (administration), M. Kunin (surveying), A. Dagot (GPS) and T. Sagiv (field photography). The best-preserved area on the hill was noted to the southwest of the hilltop (c. 22.5 dunam; Fig. 1). Remains of a Pre-Pottery Neolithic A site were revealed scattered on the eastern slope, alongside agricultural and industrial installations of later periods, including winepresses, a cistern, cupmarks and a limekiln. A systematic surface collection of flint artifacts, which were scattered throughout the hill, was performed. The area was divided into 50×50 m sections (Areas A–I) and the density of artifacts fluctuated from one lot to another. The surface collection produced 80% of all the flint finds from the site. 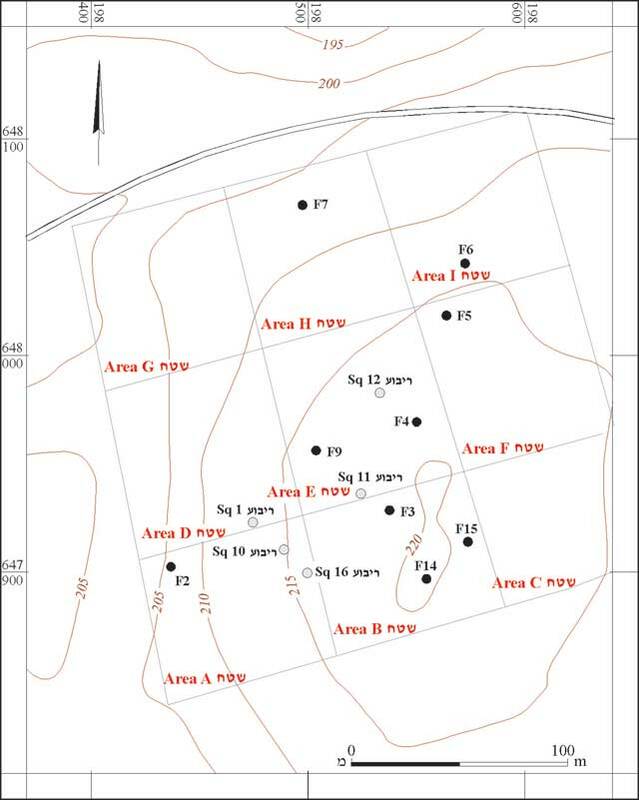 Most of the flint objects were concentrated in Areas A and D. The areas probed in different parts of the hill (10 sq m), corresponded to the level of density recorded during the surface collection. Square 1 (1 × 2 m) is located at the south end of Area D, on the western slope of the hill and Squares 10 (2 × 2 m) and 16 (1 × 2 m) are to the southwest of the hilltop, at the eastern part of Area A, where the density of flint artifacts was the highest. Two additional squares (11, 12; 1 × 1 m) were opened in Area E.
A single stratum of dark brown, loose, homogenous soil was distinguished in all excavated squares. No architectural remains or a clear archaeological layer dating to the PPNA period were exposed. The flint artifacts were, therefore, the only and single source for the site’s character. The flint assemblage: Large quantities of medium-sized flint nodules (13 × 15 cm) of gray–brown Senonian flint of the Meshash Formation were impressed in the soft limestone of the hill. It seems that the majority of artifacts were made of similar nodules. The entire flint assemblage consists of 5408 artifacts. The lithic industry is flake oriented, but all the reduction stages are fully represented (Table 1). The tool kit is dominated by bifacial tools and their fragments (86% of tools). Winepresses (F4, F6, F7, F14):Four simple winepresses were recorded and three were excavated. All have a rectangular treading floor, sloping toward a single collection vat. The floor and the walls of the collection vat in Winepress F7 were coated with plaster that contained inclusions of Early Islamic potsherds. Limekiln (F9; 3.8 × 4.2 m, depth 3 m): The limekiln was discovered c. 30 m to the northwest of the hilltop. It consisted of a circular hewn pit, with a flat bottom and upright walls, which were coated with gray material—a by-product of the burning limestone procedure. A thick layer of ash, topped with a layer of white lime, was on the bottom. Above those, the kiln was filled up to its top with limestone boulders. The limekiln’s opening was not discovered, as were the ventilation channels. Cavity (F2): Remains of a cavity were exposed at the quarried road section. The fill in the oval cavity (2.3 × 3.0 m, depth 2 m) did not contain any diagostic finds. Shaft (F5): The opening of a natural shaft, which could led to another cave or water cistern. Sarcophagus (F15): A quarried sarcophagus (1 × 2 m) that was not detached from bedrock. Both F15 and F14 seem to be part of a big quarry, probably for building stones. In the course of the excavation, no architectural remains dating to the PPNA period have been discovered. Therefore, the site cannot be defined as a settlement or another permanent habitation area. Furthermore, the total absence of arrowheads and faunal remains implies that hunting was not one of the activities at the site and lack of ground stone tools points to other means of food preparation. As a whole, the H. Kelah PPNA site reflects some of the various subsistence strategies of the period, other than permanent or semi-permanent settlements. Although the initial activity in the area had begun during the PPNA period, it was most intensively exploited during the Hellenistic, Roman and Byzantine periods, when the site functioned as an agricultural and industrial hinterland of Horbat Kelah, located to its southeast. Judging by the potsherds retrieved from the plaster of the winepress’ collection vat (F7), the use of the area was sufficient for the needs of the local population up to the Early Islamic period.